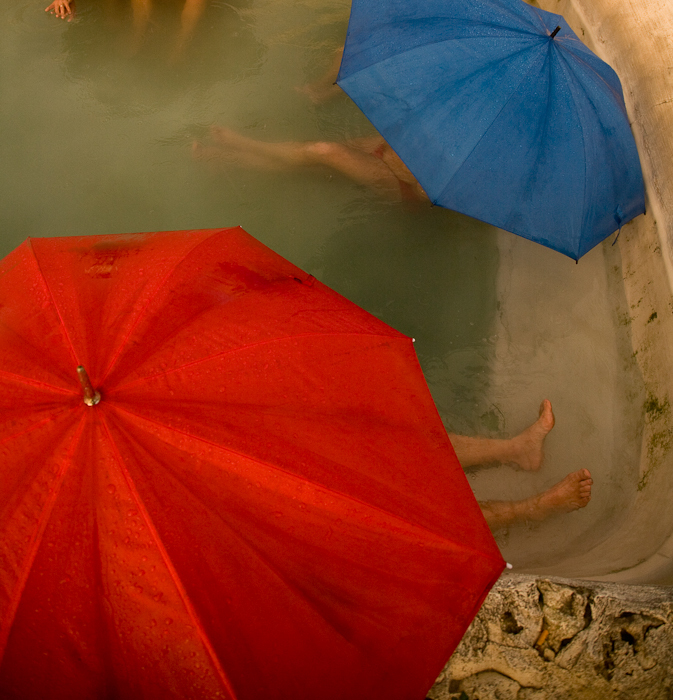 Tuscia is volcanic territory and abounds in hot springs. We are surrounded by extinct volcanoes from under which flow thermal streams, hot water cascades and bubbling springs. Some are fairly pricey sophisticated resorts with fancy hotels, massage facilities, restaurants etc; others are less easy to find…. but free. 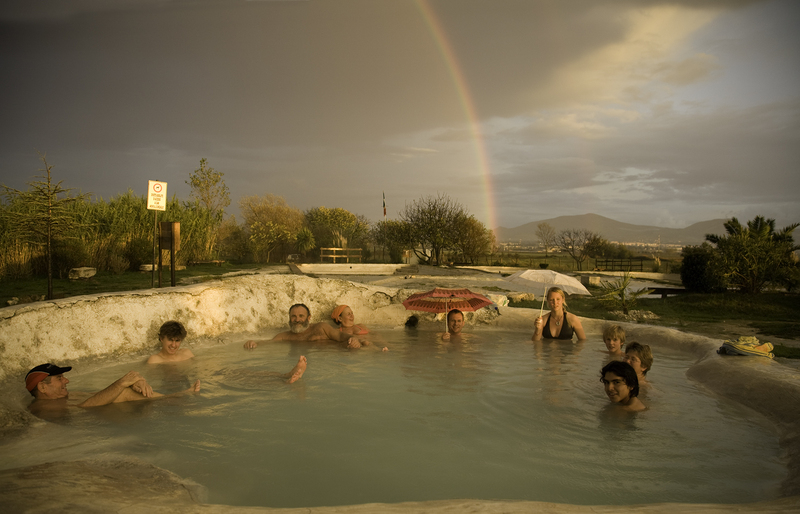 There are scores of thermal springs within an hour of Orvieto and in the cooler seasons make a delightful day out. 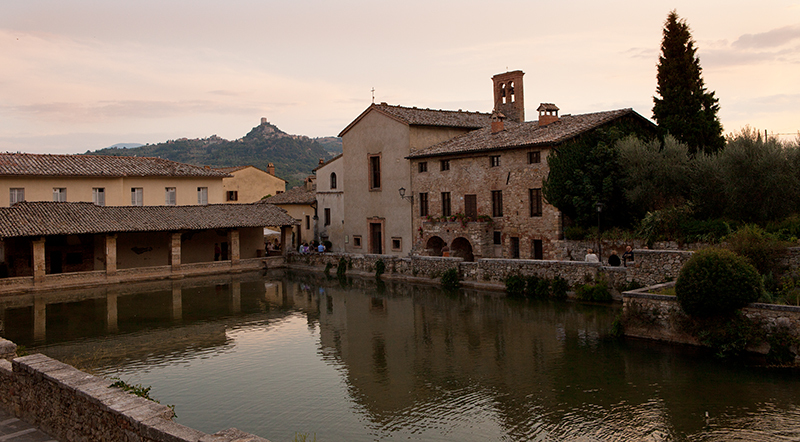 Bagni Vignoni in Southern Tuscany on the slopes below the massive Monte Amiata is a picturesque mediaeval village with typically a piazza at its centre – however this piazza has two metres of hot water in it! Lauded since Roman times for the quality of its hot waters it is peppered with fancy hotels, classy restaurants, and swimming pools of various temperatures. 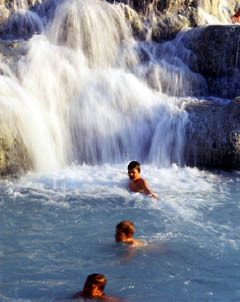 Not far from Bagni Vignoni is Terme di San Filippo which has a fashionable hotel but hidden in the nearby in the pine woods are hot springs and a fabulous hot cascade over brilliant white stalactites. A great place both to photograph, Patrick NIcholas once did a fashion shoot here, and relax under the fast flowing hot waters. Near Lake Bolsena are the fashionable baths of Terme dei Papi (The Popes’ Baths) but nearby near the road to Marta can be made out some Roman ruins, these are the rocky pools open to the sky called popularly Bagnacci (the run down old baths), well maintained and completely free. The nearby Roman ruins were still lined internally with marble until the 1950s but now are sadly denuded and overgrown. It’s delightful to arrive here before dawn and watch the sun come up on a summer’s morn, lying up to your neck in very warm water. 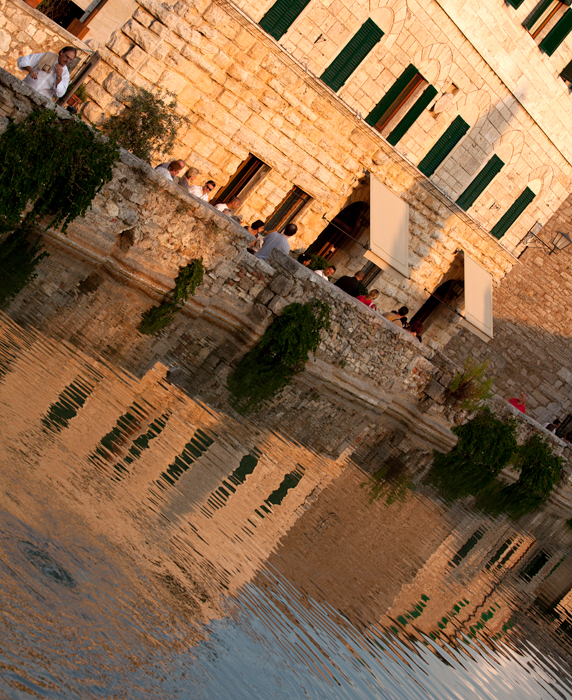 The most famous spa in Tuscia is Saturnia. Here again there is a very posh hotel with a MIchelin star, frequented by Italian film and TV stars, but just down the valley is the site of an old mill and a picturesque cascade. Here you can sit in one of the naturally worn baths under the waterfall with a bottle of whatever takes your fancy, under the heavens counting the shooting stars in August, all for free. The ancient Etruscan town of Saturnia itself is worth a visit as much for its evocative mediaeval buildings and Etrusco-Roman remains as its excellent restaurants. Unbelievable beauty at these hot springs. I visited a few years back and could not contain the joy I felt while swimming in the water.